We just had our annual Christmas party here at vcleat.com. It went well but the staff seemed disappointed that the bonus this year was an old pair of shoes. They said they were hoping for cash. I told them, “less is more”. I read that somewhere and it sounded good at the time. Sort of un-American though. 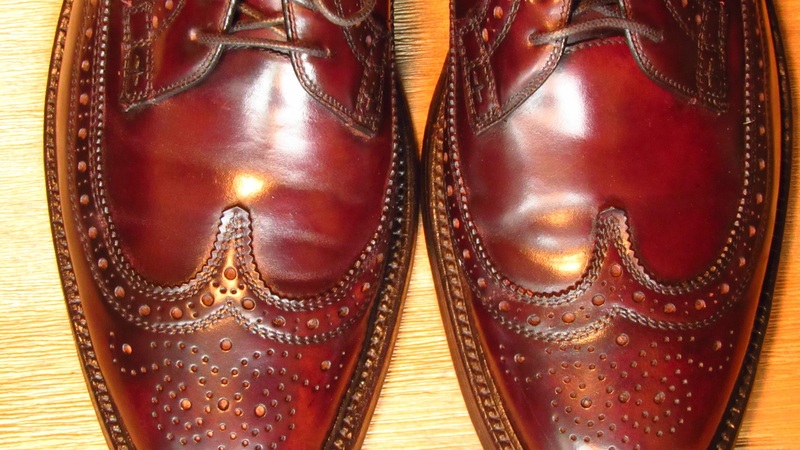 Recently, I found on eBay a pair of Nettleton Traditionals Shell Cordovan long wings in my size. This was a good find since these are rare shoes. 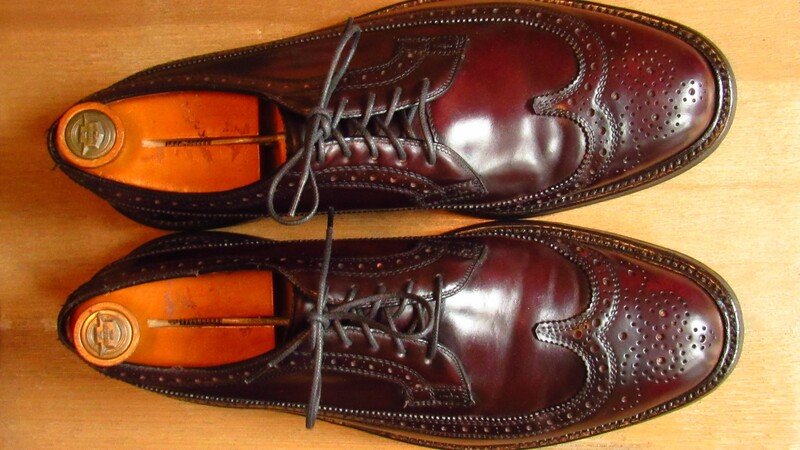 I have seen just nine pairs of Nettleton Shell Cordovan long wings in any size listed on eBay in the past two years. In the listing photos, the pair looked misshapen, dry and mottled. But looking closely at the photos, the shoes did not appear to have significant wear. Also, there were no visible shell cracking or major gouges. 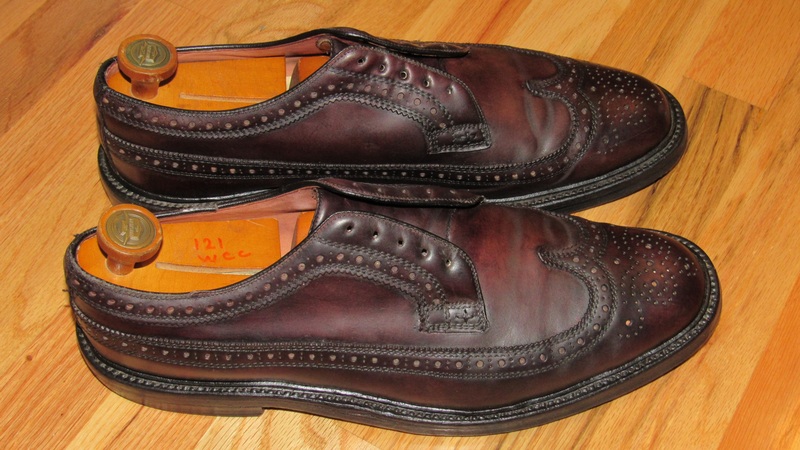 So for $30, the risk seemed low to get a pair of Shell Cordovan Nettletons. It’s unlikely another pair in my size would come up for auction. This is what the pair looked like when they arrived. Tired. They needed some work but were not without hope. I was pleased that they didn’t stink like cigarette smoke. There were no dark areas between the shell rolls on the vamp. Heavily worn shell won’t have creases but will have dark bands that develop in the trough of the rolls. This was a good sign. I wiped the shoes down with a damp cloth and then brushed them to clean the upper. The interior was cleaned with an alcohol soaked rag. Reno’Mat is my choice for cleaning Shell Cordovan. 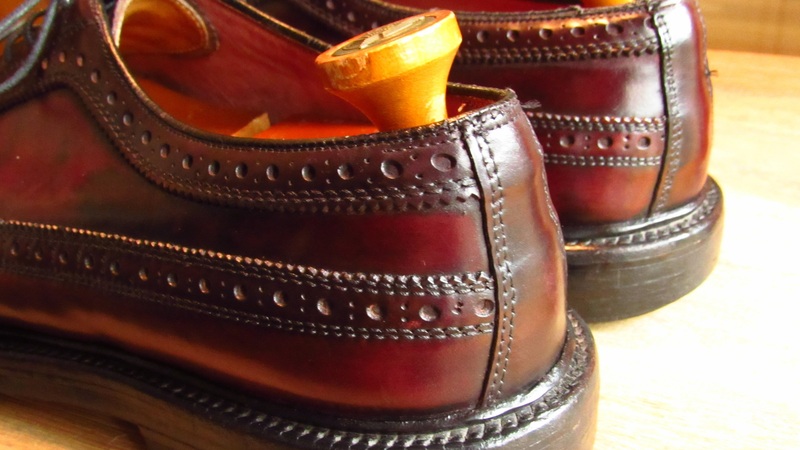 It generally will remove old wax and polish, and if applied gently will not harm the finish of the leather. Unfortunately, Reno’Mat didn’t do much to clean the pair. The color variations were not due to old wax or polish. After Reno’Mat, I moved up the solvent scale and used Angelus Deglazer. Angelus Deglazer is like acetone but the manufacturer says it is more gentle than acetone. Its for removing the top finish of the leather. The Deglazer helped a bit but didn’t remove all of the dark areas. In some areas, I rubbed too hard and went down almost to bare leather. Oh well. It was hard to gauge how much top finish was removed because the deglazer wet the leather. For conditioning, I started with a glycerin solution. This a popular method with a number of the Japanese vintage shoe bloggers (See europeanblend_noswbox’s excellent blog). Its a solution of water (2/3) and glycerin (1/3) applied to the uppers. 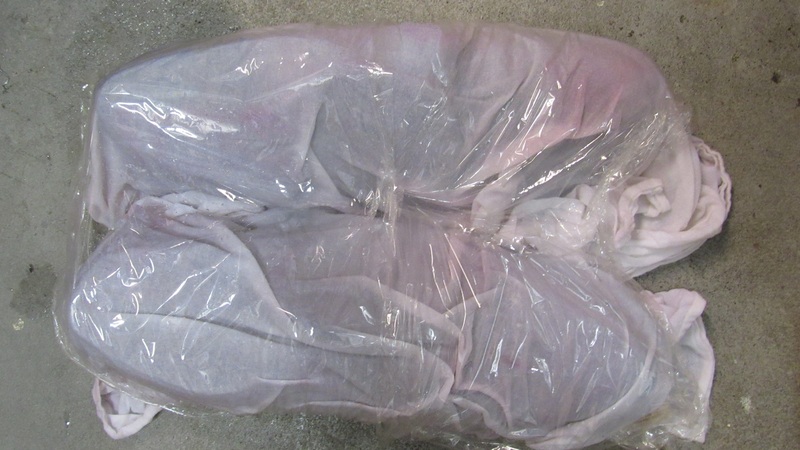 The solution is runny so you need to wrap the shoes in a cloth and soak the cloth with the solution. I left the solution on the shoes for 6 to 8 hours. 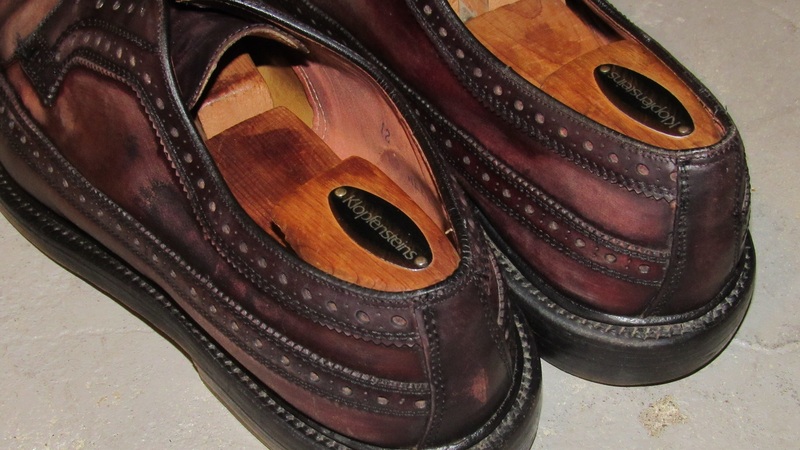 I kept cedar shoe trees in the shoes during the process. The shoes are damp/wet after the glycerin solution. Below is a photo a day later when they dried out. The glycerin leaves the shoes cool to the touch. The pair was a bit darker after the process. 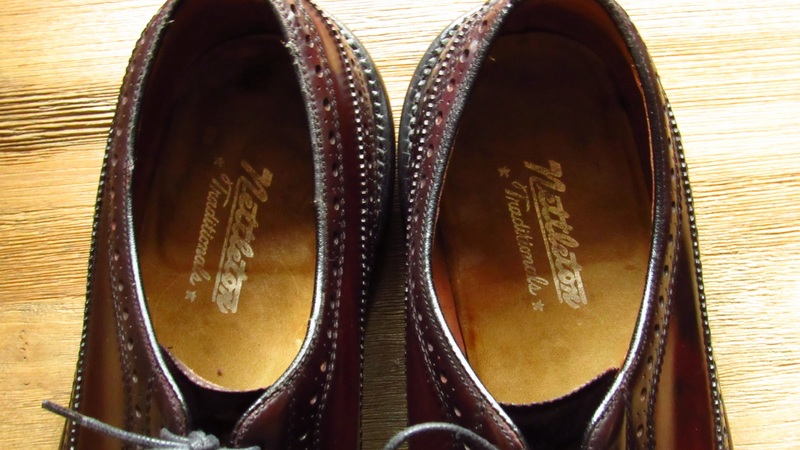 During the drying process, I left shoe trees in the shoes and this helped to reshape the leather back to a normal shape. I then did two rounds of Bickmore Bick 4 over two days. The Bick 4 was applied generously and worked into the leather. Bick 4 darkened the leather a bit more and gave the shoes a bit of a shine. 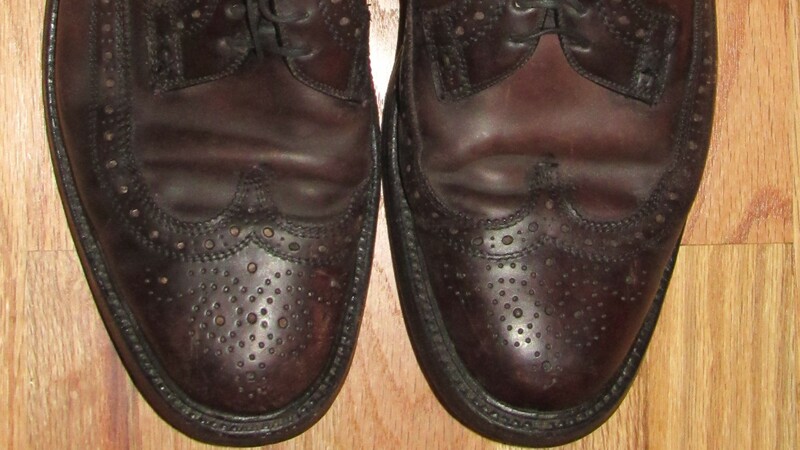 To restore the color of the shoes, I applied two rounds in two days of Allen Edmonds Cordovan Shoe Care Cream. This is a high pigment cream that I have used on other pairs. It’s a great product for restoring the color of older Shell. 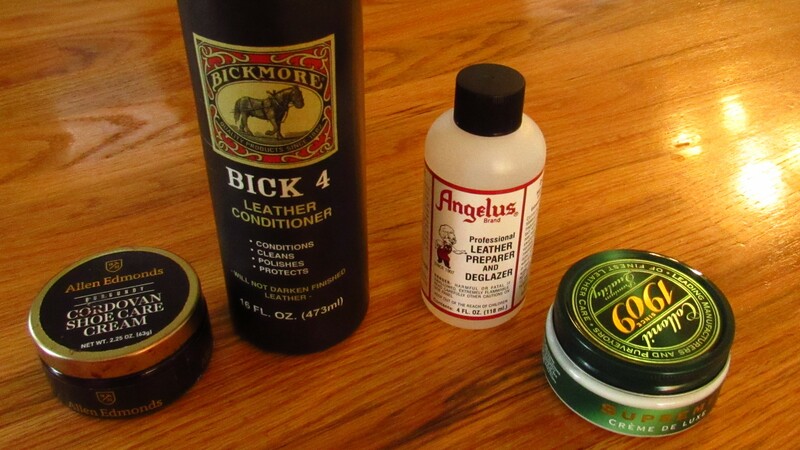 I find it works the best when you apply a very small amount and work it into the leather with an old t-shirt. The AE Cream will also provide a healthy shine for the shoes. Finally I applied one coat of Collonil 1909 Neutral. This product is similar to Saphir Renovateur or Venetian Shoe Cream but with the shine turned up to 11. The finished shoes looked great. Better than I expected. The color evened out but there was still a dark path on the outer right shoe. The shoes had a depth of color you can’t find on any new pair at Nordstrom. 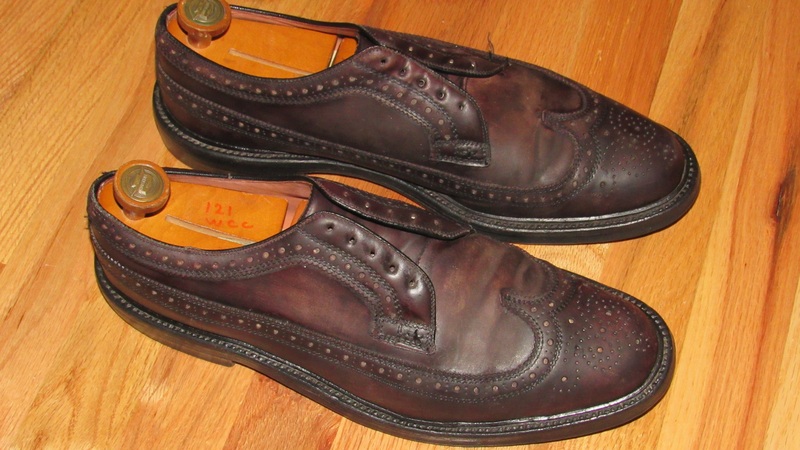 As far as I know, Nettleton had two brown Horween Shell Cordovan long wing models: 0208 and 4038. I am not sure what the difference is between the models. Both were from their Traditionals line and look identical in the photos I have seen. The models have classic gunboat features – double leather soles and reverse storm welt. The 4038 is fully leather lined. 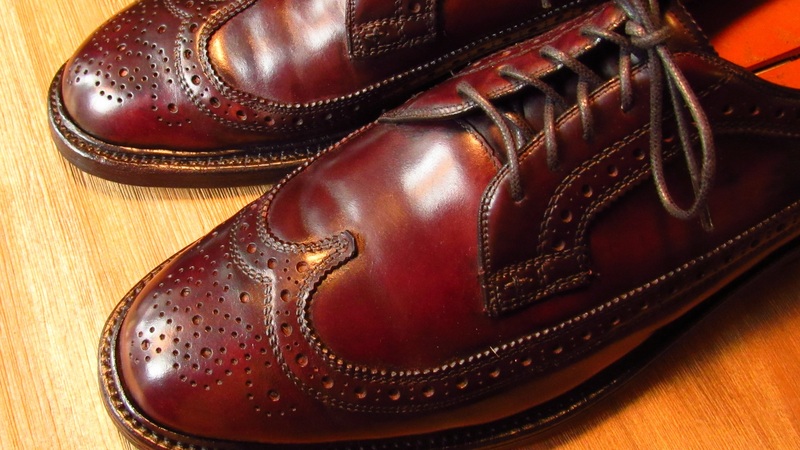 Construction is similar to vintage Florsheim Imperial Kenmoor, Hanover LB Sheppard or a modern Alden. The date code on the shoes is “A3” which means the shoes were likely manufactured in January of 1973 or 1983. I am guessing 1973. Either way, the pair was made in Nettleton’s original Syracuse factory before it closed in 1984. I wore the shoes around one day and they felt true to size. I normally wear a 11.5 D (11 D in barrie), but will also wear 12 C with thicker socks. 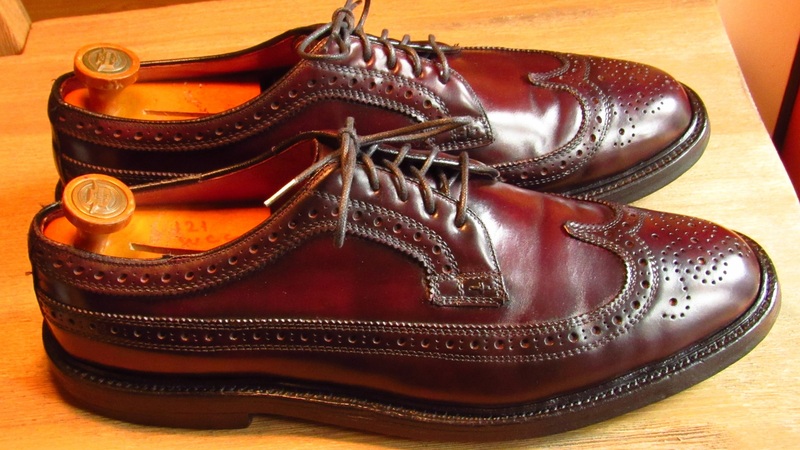 This pair is a 12 C and fits like Florsheim Imperial Kenmoors I have in the same size. 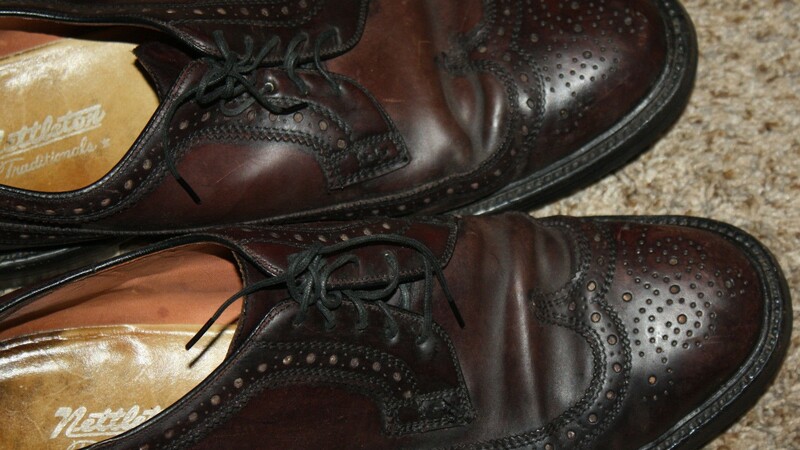 There was a recent discussion on vintage shoe hygiene methods on StyleForum. I recently bought a UV shoe sanitizer called UV Total Recovery Shoe Sanitizer by UV Total Recovery. It appeared to work but sadly, I can’t count how many germs it killed. They are too small. I will have a review of the system in a future post. See an update on the pair in this post. Amazing work, nothing short of a miracle…really love watching this “comebacks from Hell”! Is the glycerin solution primarily for shell or is it recommended for calf as well? I have used the glyercin solution on both. The other bloggers have done both as well. 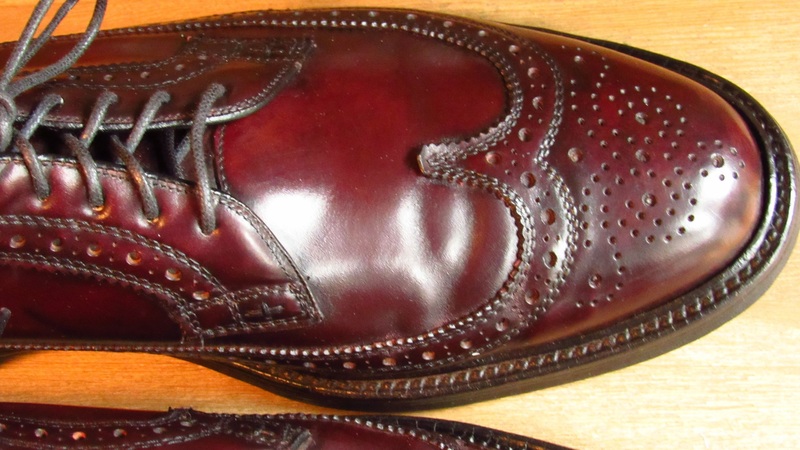 I conditioned a 1959 calfskin pair last night using this method. But this time I used lexol nf first. I let them sit a day between conditionings. I will post the results. 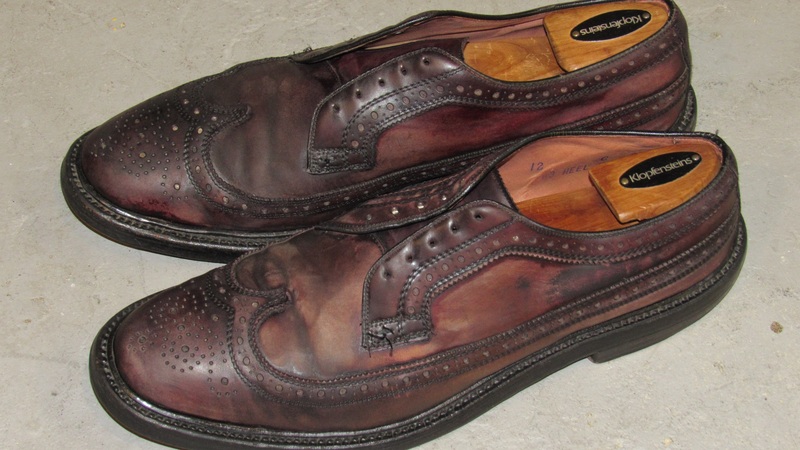 I’m in the process of doing this to a pair of ebay sourced Florsheim longwings in shell. So far the glycerine treatment (which was left on for just shy of six hours) has darkened them to the point where they are almost black. They are taking a considerable time to dry out however as the weather here in the UK has been steadfastly wet for the last couple of days. I’m praying that they come back to that dark coca-cola colour they were originally. I haven’t experienced that but I assume they will lighten but it might take weeks or months to do so. Yes, if you mean the lower pictures where they are very dark, bordering on Aubergine. I left them outside to dry yesterday, it was warm and sunny. They dried fine and I applied a coat of Saphir renovateur and brushed. The worrying thing to me at the moment is not only the darkness but that they won’t/don’t seem to come up to a much of a shine, retaining an almost matt appearance. I’m going to order some Collonil 1909 on the strength of your recommendation, as well as a horse hair brush. All I have presently is a very seriously ancient bristle brush that really ought to be confined to the dustbin. Saphir is good at conditioning. It provides some shine but its not a high shine product. I like Collonil. 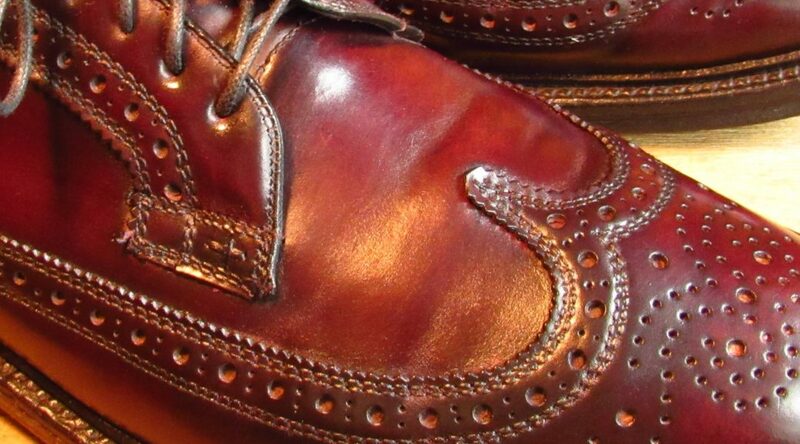 AE Cordovan Cream gives a good shine. As do waxes. But I use them sparingly. Nice work. 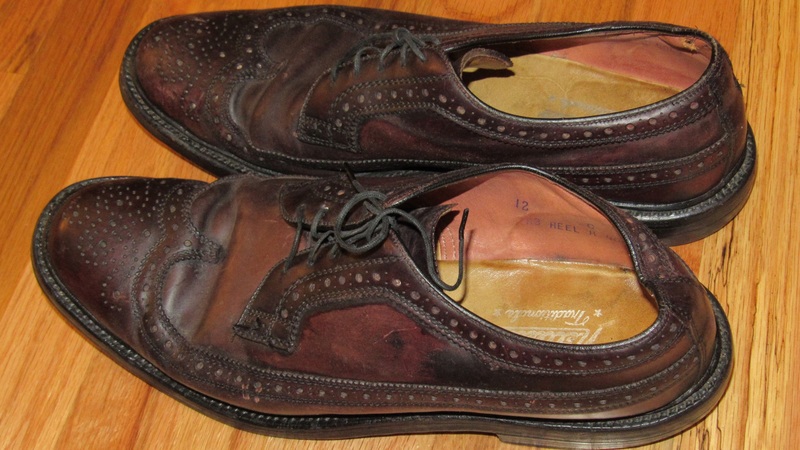 I’m thinking of doing this to a pair of Florsheim 93605s (shell, of course). The uppers are in good shape; they are not dry. But the creases are severe and when I wear them, it’s digging into the top of my foot. So, I want to reshape the leather. I thinking that soaking them might be a bit extreme and that the glycerin treatment might be the way to go. What do you think? I am not sure that will help. Unless the shoes develop a new break on the vamp after the treatment, they may fit the same. If I find a pair isn’t comfortable after wearing, I tend to resell the pair. Inserts can sometimes help but probably not in your case. You didn’t mention how you addressed the loose rolls in the vamp. Did you shrink them somehow or did the glycerine treatment & trees reshape them? I am working on a pair and there is a “looseness” just under the wing that I cannot seem to rectify. Yours seemed similar when you got them but the rolls were largely gone by the end. Try to find a shoe tree set that fits tight in the pair. The condition the pair a few times over the course of a few days. Work the conditioner in with an old t-shirt. I find the rolls lessen quite a bit after that process. Will give it a try with several rounds of conditioning. Thanks for the reply and for this amazing resource.